​Imagine if you could transform your everyday bicycle to have the look and sound of a real motorbike. - Well imagine no more because Turbospoke does exactly that! 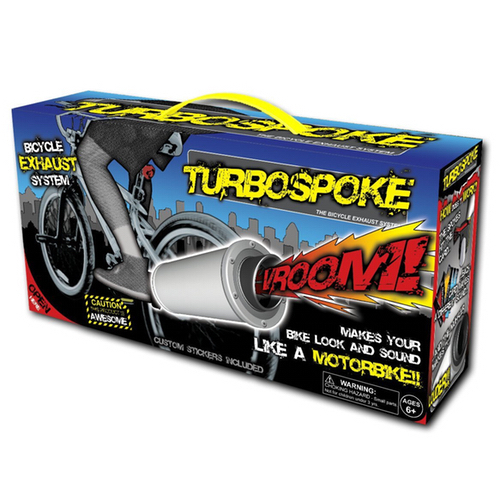 Turbospoke not only has the look and feel of a real motorbike bicycle exhaust pipe, it also makes the most awesome realistic engine sounds. The engine sounds start as soon as the wheels turn, so the sound changes as your speed does! What’s more is that Turbospoke requires no batteries to make it work, it is 100% pedal powered. The sounds are made by a thin plastic ' Motocard' which is held against the spokes of your wheel. Each Turbospoke comes with 3 Motocards which are tuneable for up to 6 different sounds. The sound travels up the exhaust pipe and gets even louder!! Turbospoke is designed to fit to 95% of bicycles. Approximately ages 6+, wheels of 16" of greater.